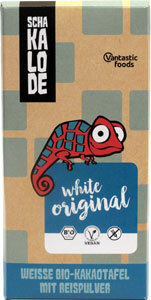 If you love creamy dairy-free white chocolate, this bar from Vantastic Foods will be just what you're after! Rich, decadent and delicious, this German-made vegan delicacy is certified organic, made with top-quality ingredients to give you the best in every bite. 80g (2.85 oz.) bars are $4.99 each. Imported from Europe. From JHerring of Philadelphia, Pennsylvania on 10/30/2018 . I received my order on Friday. This vegan white chocolate bar is very good. I will be ordering it again. From Anonymous of Piscataway, New Jersey on 10/29/2018 . I really liked this bar. It wasn’t overly sweet. It tasted like the hollow chocolate bunnies you get at Easter time. It’s not as creamy and fatty as Charm School, but I like how this bar doesn’t have any coconut or coconut mana flavor to it. I would buy this again.